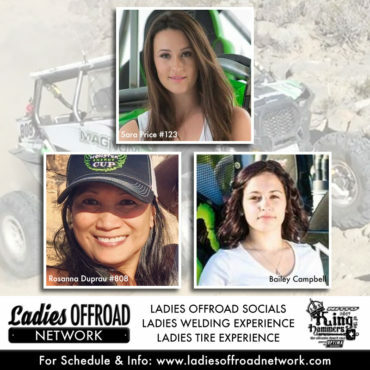 Everyday from 9-11am the Ladies of Hammertown gathered at the 4 Wheel Parts booth for a Ladies Offroad Social with coffee, cocoa, tea, water and snacks for a casual environment to talk and get to know each other. 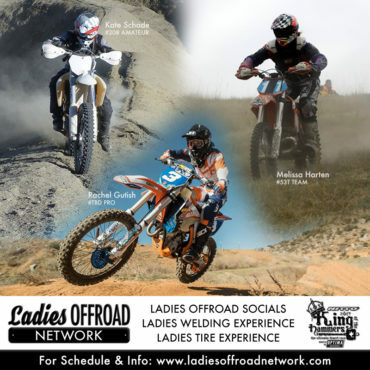 In addition to the daily socials, there were two hands-on experiences that ladies could participate in. 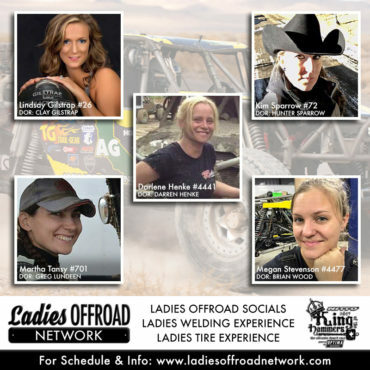 On Tuesday afternoon over 60 Ladies gathered to try their hand at welding at the Ladies Offroad Welding Experience hosted by ESAB Welding & Cutting, and on Wednesday Ladies gathered at the BFGoodrich Tires Garage for the Ladies Offroad Tire & Winch Experience to learn how to change a tire from Brad Lovell and work a winch line with WARN. 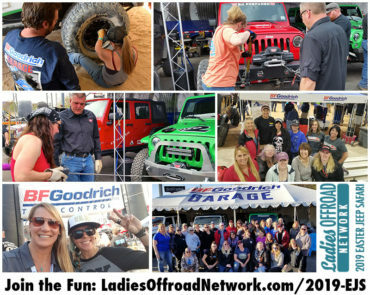 At each event the ladies were entered into immediate drawings including I’m Not Just a Girl shirts, ESAB Welding Helmets, BFGoodrich Tires Gloves and more. 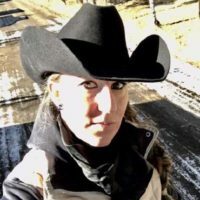 They were also entered into the week-long drawing for the Black Forest Gear $649 Fridge/Freezer and Kicker $199 Amphitheater. 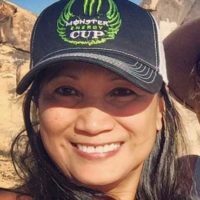 We had an amazing time at the 2017 King of the Hammers! 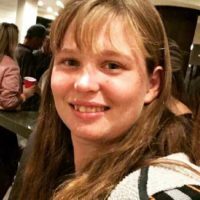 The week has expanded and it is hard to keep up with all the activities and excitement of the week. 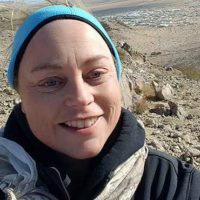 Doing daily posts from the lakebed has become unreasonable for us - instead we spend our time trying to be everywhere at once and getting all the pictures and videos we can. We have spent the last couple weeks compiling everything into what we are calling the #KOHredo. A day-by-day recollection of the whole week. It's fun and exciting. 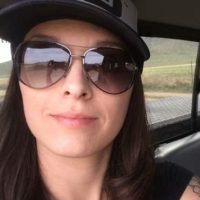 Join along in the adventure, or catch up on the events here. It's going to get a little wild come the middle of the week! 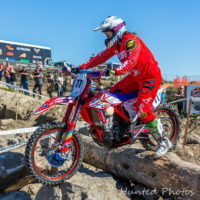 Facebook - you can see all the pictures and galleries without being logged into Facebook. Feel free to TAG & SHARE any picture or gallery. 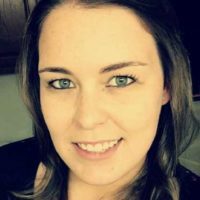 YouTube - feel free to embed any video into your stories or website. 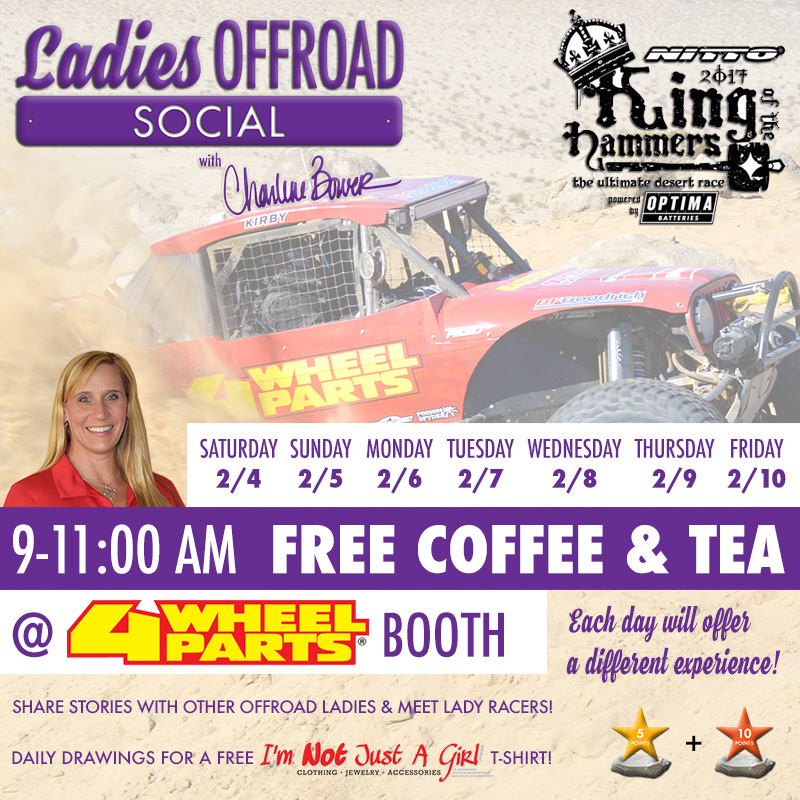 We will be hosting Ladies Offroad Socials and Hands-On Events during King of the Hammers week! 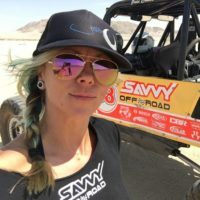 @charlenebower at the @ultra4racing #kingofthehammers :::: UTV race started at 8am this morning! 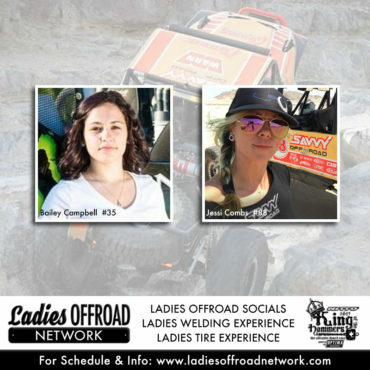 Here are the #teryxgirls taking off into the desert! Who Should You Cheer On? 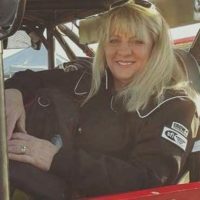 To be added to the list of Lady Racers, please contact Charlene at Bower Media here. 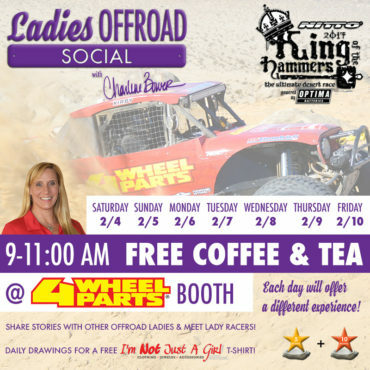 Join us each morning at the 4 Wheel Parts booth for free Coffee and Tea. 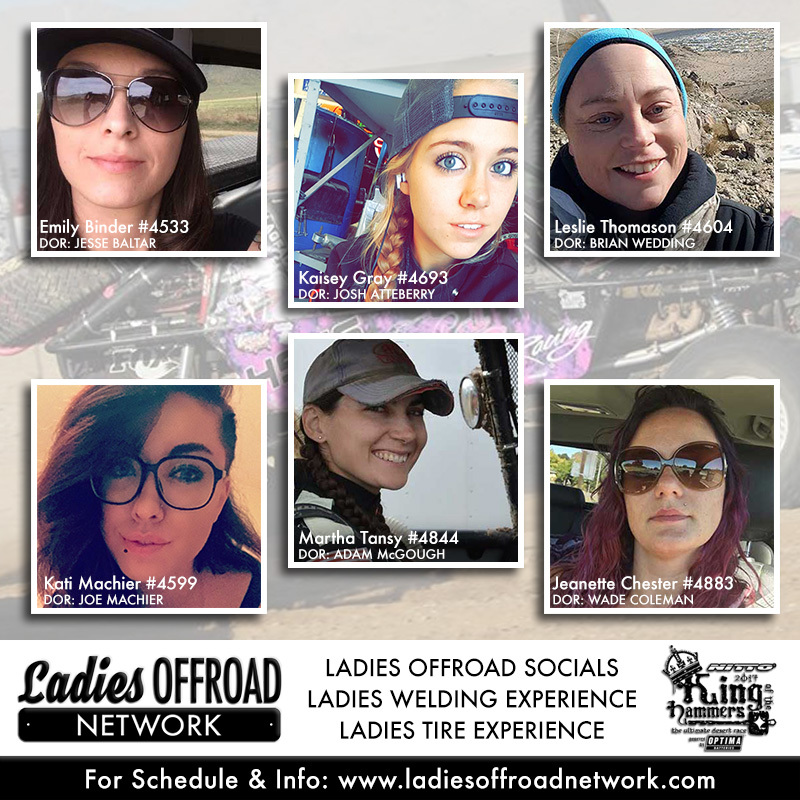 A casual environment where you can stop by for a few and meet the girls that are there, or stay and enjoy some fellowship. 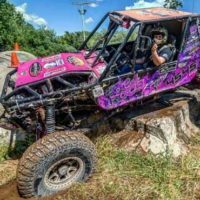 Swap stories about wheeling, feeding your whole team, dirty kids, your travel experience to KOH or anything that fits your fancy. We all have a lot in common, it just takes a few minutes to open up and we will all be laughing. Each morning will have a different experience. 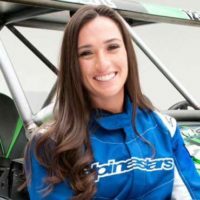 All the Lady Racers have been invited and will be stopping through when they can between pre-running and racing. I have also invited the guy racers to drop through! 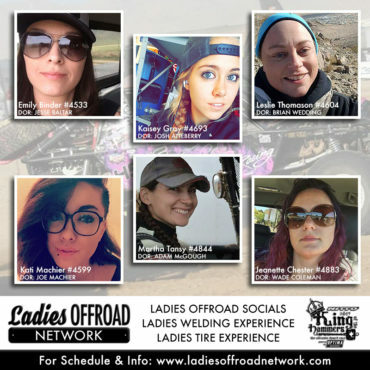 This is a great place and time to meet with friends that you have met online or wheeling in other areas. Feel free to utilize it as a group spot. Of course, if you would like to bring something to share you are absolutely welcome to! From show and tell to your favorite snack or....? 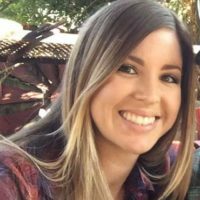 Trisha Hammer (Jeremy Hammer #97 wife) said it best - "The guys can walk through town and they waive and know all kinds of people. We walk through and don't know anyone. These morning coffee's are going to change that. 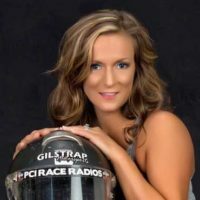 Now we will know each other and be able to say HI while wandering around or at the drivers meetings, which will also transfer into the next race and online. I'm excited! 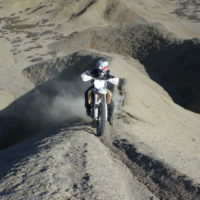 Once I get on the lakebed, I'll be at every one!" 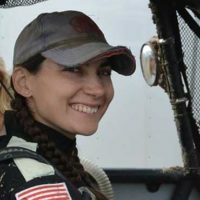 You wanted to weld, we listened! 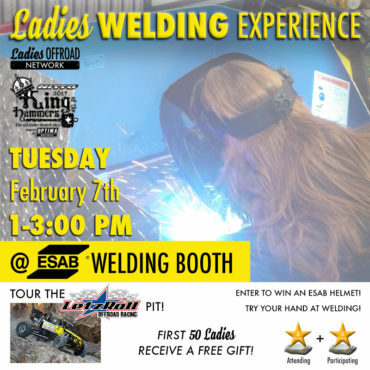 We partnered with ESAB Welders, the Official Welder of King of the Hammers, to put together a Hands-On Experience for all ladies to try welding! 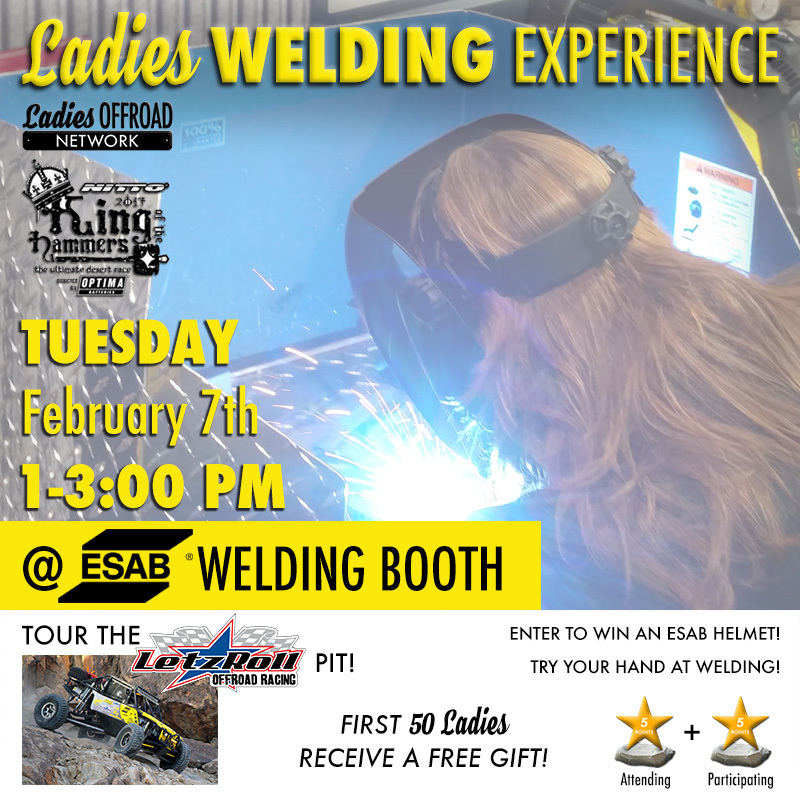 Drop through between 1pm and 3pm to throw on a helmet, gloves and jacket and get instructions on how to weld. 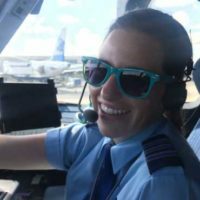 Talk about fun! When you are done welding, or while you are waiting, you will have the opportunity to tour the LetzRoll Offroad Racing working pit that has two race cars taking a green flag - Driver of Record Andrew McLaughlin will race in the Every Man Challenge #4893 race, then Andrew McLaughlin #4493 will qualify during Power Hour on Wednesday night and race the main race on Friday. 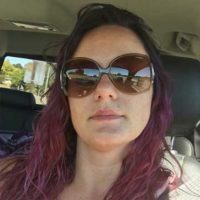 Andrew and his team will show you around and answer any questions you have! 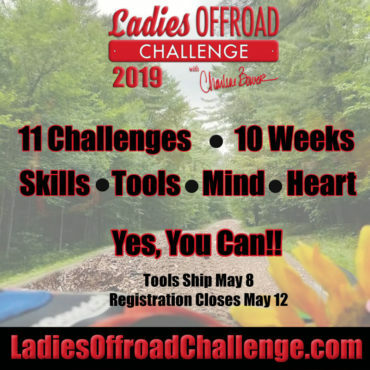 You want to broaden your skills and meet Frankie the BFGoodrich Tires Jeep that we took on the Trail of Missions and Rebelle Rally as part of the Ladies Co-Driver Challenge. We listened! 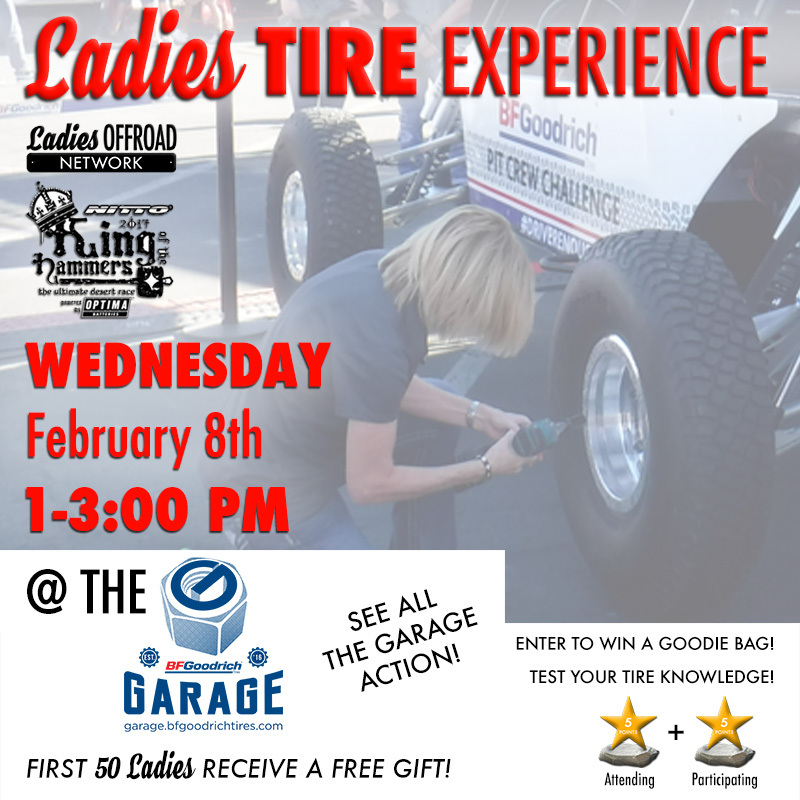 We partnered with BFGoodrich Tires to put together a Hands-On Experience for all ladies to change a tire on Frankie! Drop through between 1pm and 3pm to use a jack, an impact and star. Don't be intimidated, or feel like you already know how to do it. 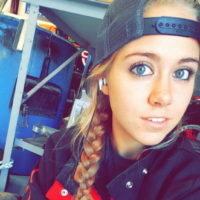 This is a perfect environment to change a tire or get some pro-tips from the instructors. You CAN do it! 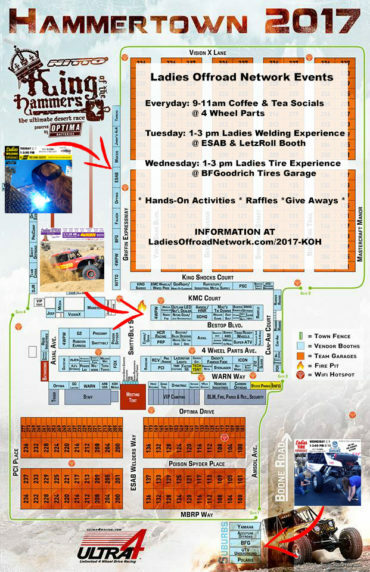 When you are done changing the tire, or while you are waiting, you will have the opportunity to tour the BFGoodrich Tires Garage working pit that will be supporting the Every Man Challenge racers. Guaranteed there will be some kind of action happening! 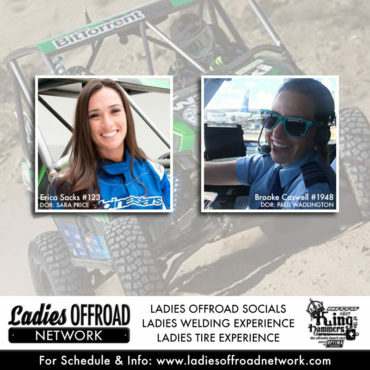 You will also be able to learn about tires and ask questions specific to your situation. 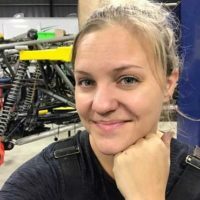 Did you know tires have over 30 layers in them? 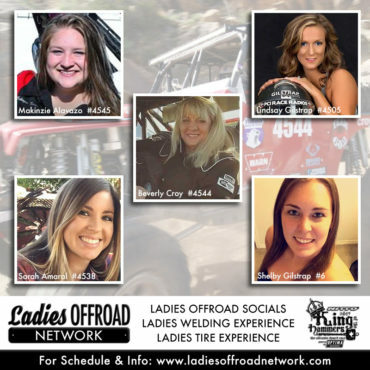 The first 50 ladies to show up will receive a special gift from BFGoodrich Tires! 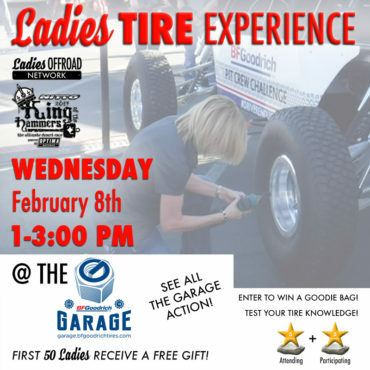 Everyone that comes will be entered to win a BFGoodrich Tires goodie bag and more! Just by showing up you will receive 5 Rock Star points, and by participating you will receive another 5.